MIKADOweb is an innovative lightweight structure from short rods assembled in an irregular order forming a widespan, free-form shell. The irregular order of the rods allows high tolerances. A suspended membrane, usable as building skin stabilizes the shell structurally. The connections are simple and low cost allowing erection with unskilled workers. The usage of bamboo as lightweight, widespread material is ideal for this ecologically, economocally sustainable building system. In collaboration with Prof. Dr.-Ing. Eda Schaur, Institute for Structure and Design, University of Innsbruck and students an erection system was developed and tested in diverse scale models and experimental structures. The design strategy for this project was an investigation into spatial connections between man and environment, creating an egg shaped space dissolving materiality from inside to outside by multiple layers, structural diffusion and optical distorsion. The design criteria of Florentine Sack’s dissertation were used in the development of this multilayered structure of a shell with suspended membrane as building skin. Therefore an irregular shell from short rods was created, whose order can not be followed visually. By this seemingly missing order the spacial barrier of the shell is less rigid. This effect is enhanced by the membrane suspended from the structure. Like in a multilayered baroque church the spacial barrier between inside and outside is diffused. The shadowplay of the shell is distorted on the membrane which adds to the imperfection of the structural perception. The tower is designed as a calm and elegant backdrop to the artwork that will be attached to it. 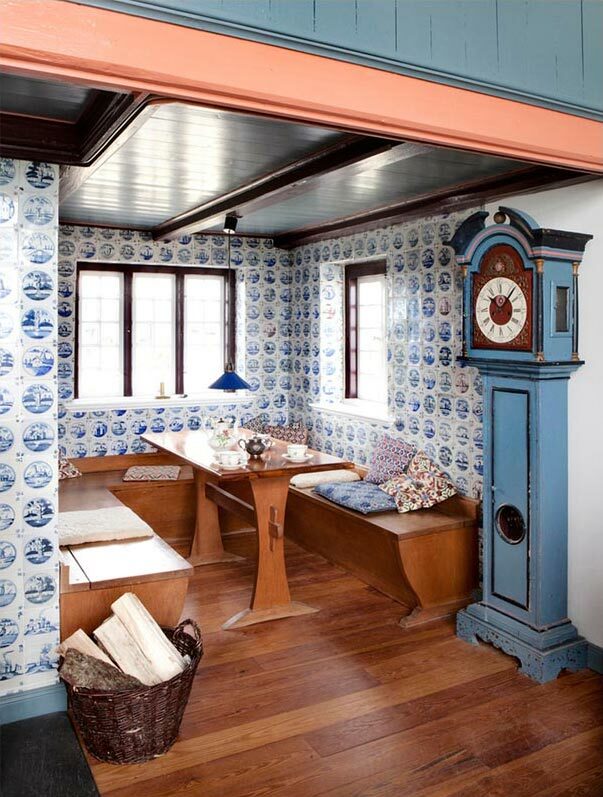 It should not dominate the work but rather provide a delicate and calm backdrop. The panels to which the work is attached are see-through, to allow the use of light and also to allow the wind loads to be reduced. It is the intention that great care will be taken in the detailling of the structural connections, so that the structure itself can stand as an artistic piece. 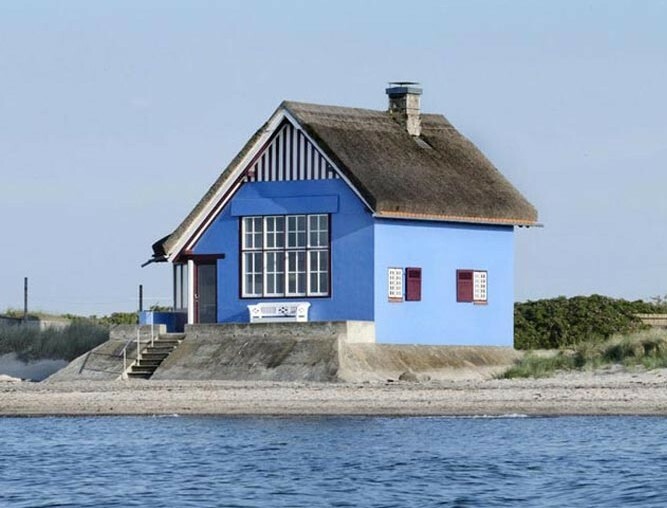 The Blue House in Heiligenhafen originally situated in a meadow without sea breaker was built by an artist at beginning of 20th century and is a listed building. Although its groundplan is fairly small it has a very generous atmosphere by the double height studio space with huge window and gallery to two small sleeping rooms and tile niche below. The foundations undercut by water in the 1920s were underpinned by an injection procedure. The substructure of the floor was renewed and insulated as the walls. The big studio window was replaced with original profiling, insulation glass and invisibly integrated shutter. The exteriour was repainted with varnish common in coastal areas, for a bright blue colour the only way. Inside the newly painted off-white walls are accentuated by blue/grey wooden cladding and timber beams in a soft rusty red. The seating of the furniture partially dated mid 19th century was restored with original materials and weaving techniques. The table was sanded to match the floor. Armchair and sofa were upholstered with robust fabrics in neutral grey and black to highlight the colours of old chairs and painting. All works were executed with local firms. 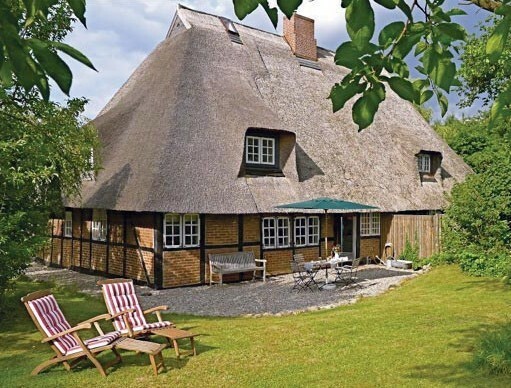 The farmhouse in Behrensdorf, built in the 19th century is a listed building and one of a few belonging to Waterneverstorf Manor. Bought in a derelict state by the client it needed major repairs. 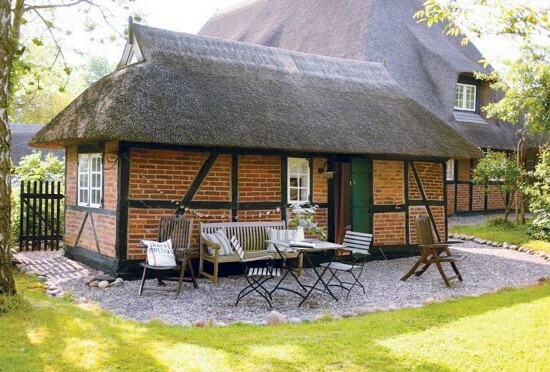 The thatched roof was replaced and the roof structure repaired. 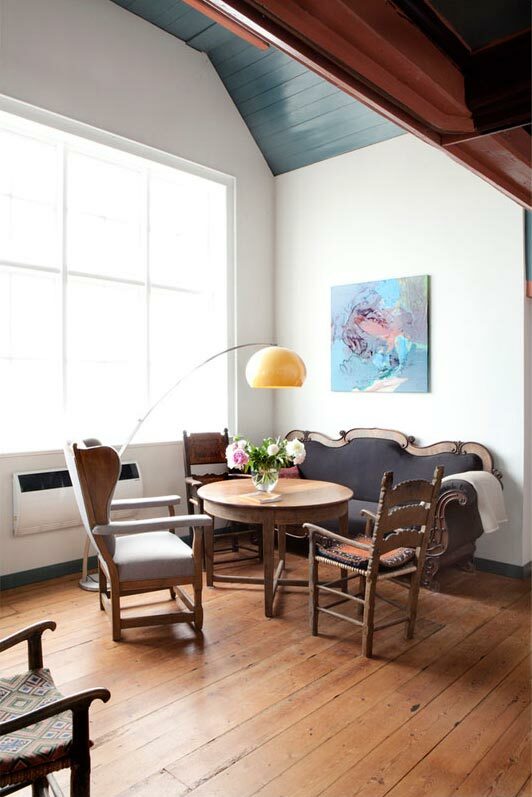 The heybarn under the roof was converted into a spacious studio apartment, the groundfloor was turned into a large apartment. The small side building originally used for farming equipment was turned into a tiny apartment. To get the buildings dry from the ground they were surrounded with a drainage taking rain water away. The buildings were completely insulated from inside including floors, walls and ceilings, showing the beautiful frame- and brickwork outside and allowing thermal diffusion. All works were executed with local firms.